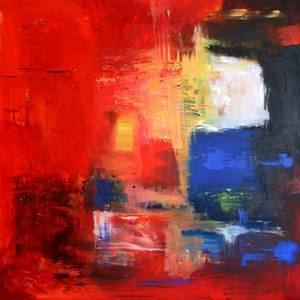 Claire McCarthy practiced art from the mid 1990’s creating different phases to achieve a contemporary vibrant portfolio. Watercolours are the foundations of all her large pieces, initially focusing on “Urban Spiritual Expression”. In 2010 she looked to the shores of North West of England, North Wales, East Anglia and Scottish Highlands. The art transpired from her nephew’s life being cut short by a mountain climbing accident. The Land and Seascapes represent the harshness of nature and energetic movement of air and water over sand, silt or rocky lands. It was from there she found lifes renewal of spirit after time of deep sadness. Claire’s mood brought her to paint on hardboard and canvas, throwing the paintbrush aside to use her hands, fingers and sticks from trees. It was important do this as it assisted to define the changeable movement of nature. By 2012 inspiration came from a dream of being a child again spending time with her late Father, in the kitchen of the house where she was brought up. The place no longer exists so everything had to come from memory when painting the scene. Music by Pink Floyd and Brian Eno was played to help with the painting. It was called “Council House Window and Kitchen Sink in The Morning” and it was accepted by the Mall Galleries Threadneedle Prize Exhibition the same year. A series continues to develop as it resonates with memory and her Mother living with Alzheimers. Claire McCarthy had to take time out from exhibiting to care for her Mother and by 2014 onwards she’s observed the fluctuating decline of her Mothers memory. Its brought about non- figurative watercolours and acrylic paintings of Windows and Spaces. Combining Council House Series, Landscapes and Street Scenes, all views opening and shutting one by one. These windows are precious memories, despite being vague or distant, the brilliance of love, life and spirit prevails through them. Vibrant colours, light, shapes and movement of paint, are emotive expressions that echoes throughout all her work. This year in 2016 Claire is back working towards new exhibitions and continuing her practice and art career. Artist influences in no particular order; Frank Auerbach; Joan Eardley, John Hoyland, John Houston; Mark Rothko; Helen Frankenthaler; Leon Kossoff; J.W.Turner; Edward Hopper, Georgia OKeefe; Lee Krasner; Wassilly Kandinsky and C.Y. Twombly.